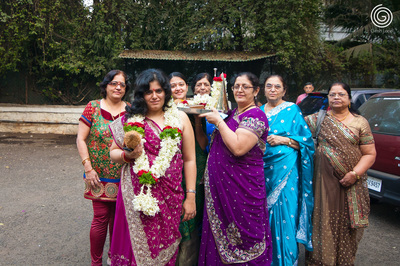 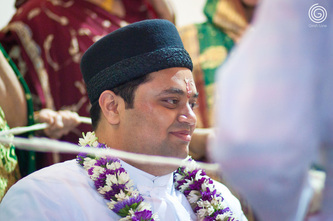 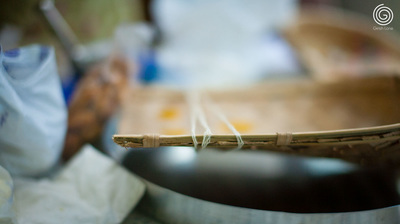 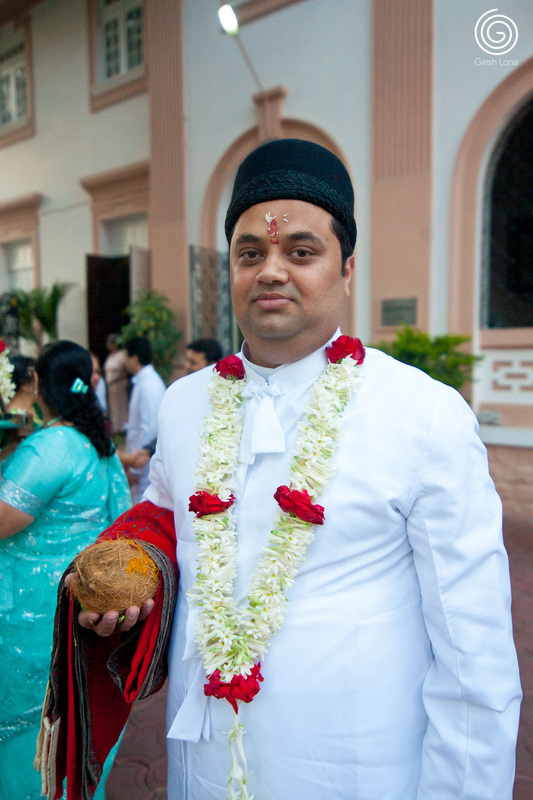 Madhavsaro ritual is performed 4 days prior to the Lagan (wedding). 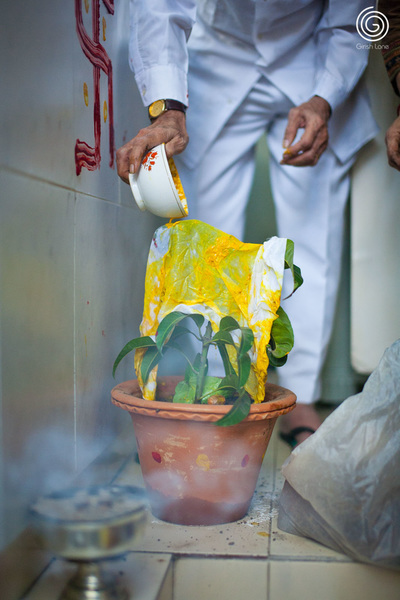 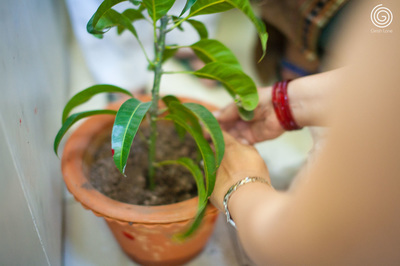 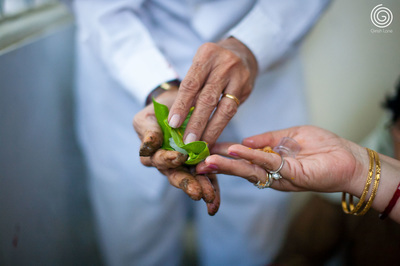 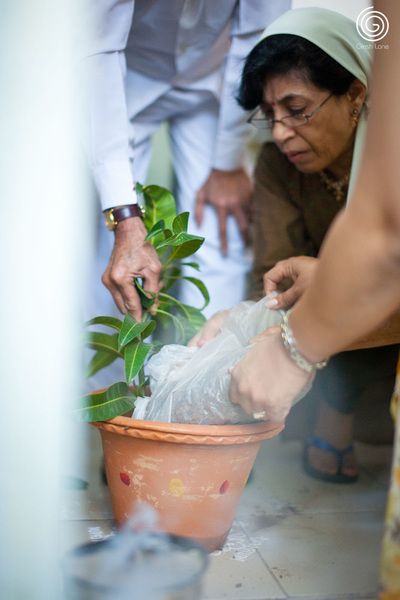 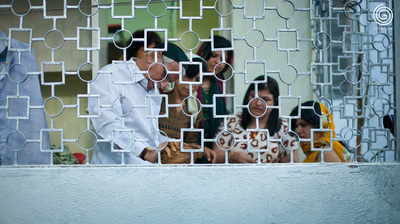 The families of the bride and the groom plant a tree (mango tree) in a pot individually. 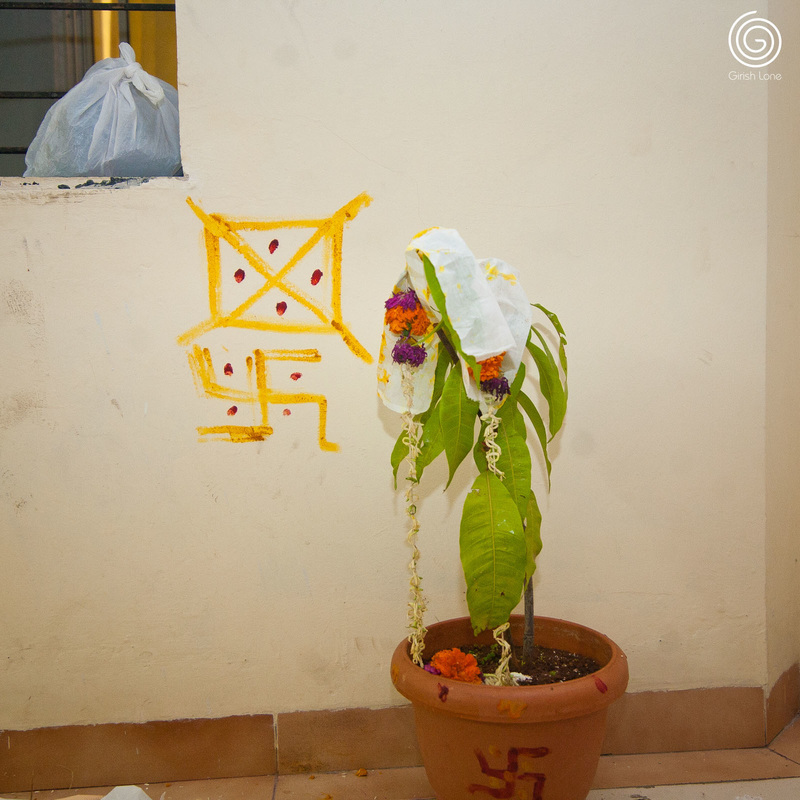 This pot is kept at the entrance of the houses and watered everyday till the eighth day after marriage and then planted outside. 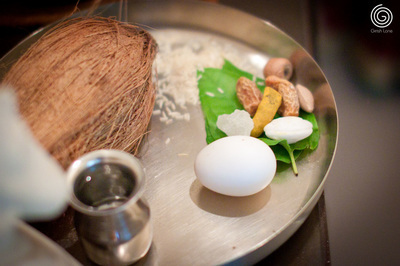 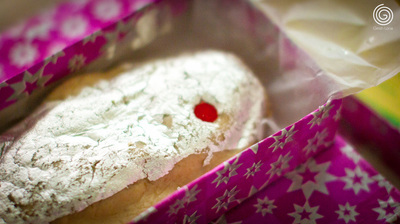 After this Supra nu Murat ritual was performed. 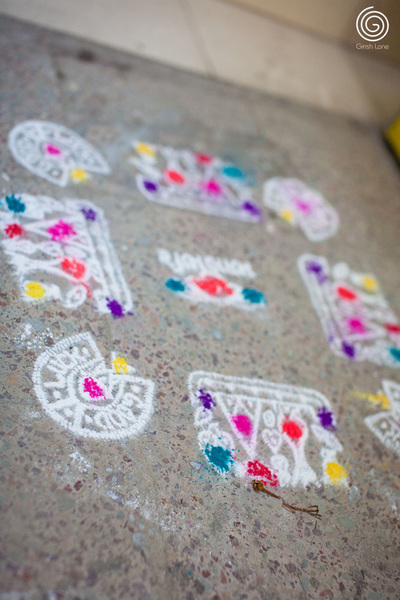 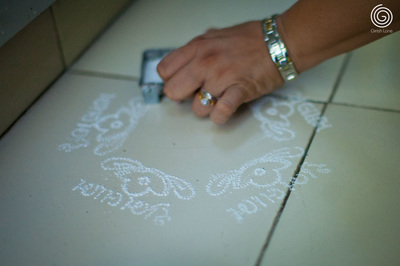 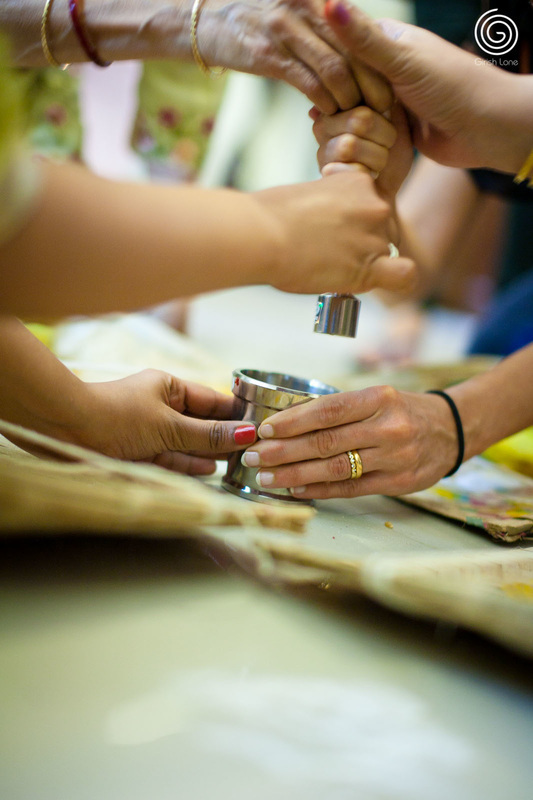 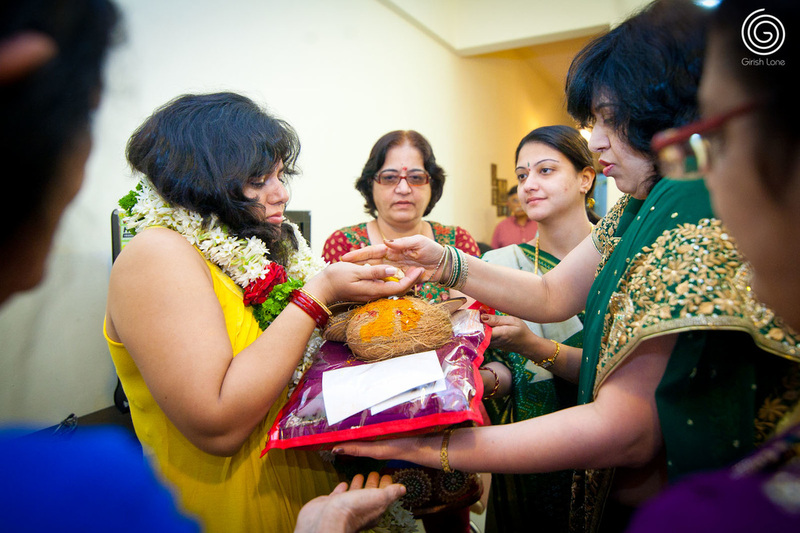 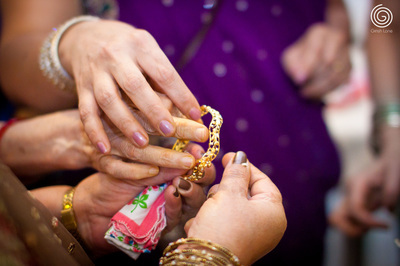 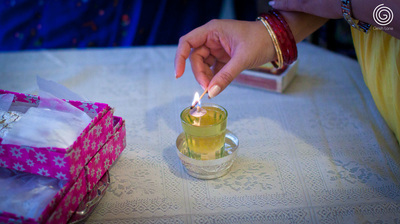 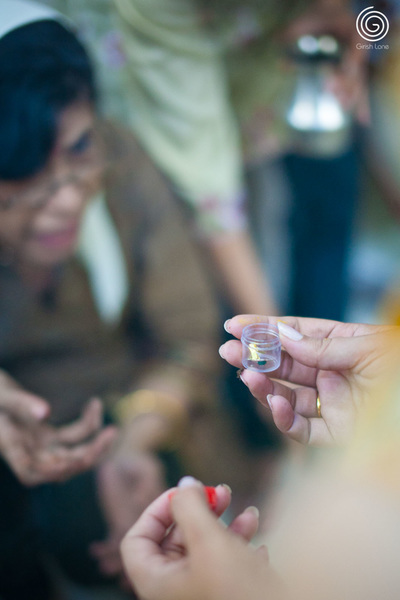 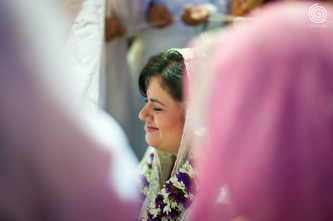 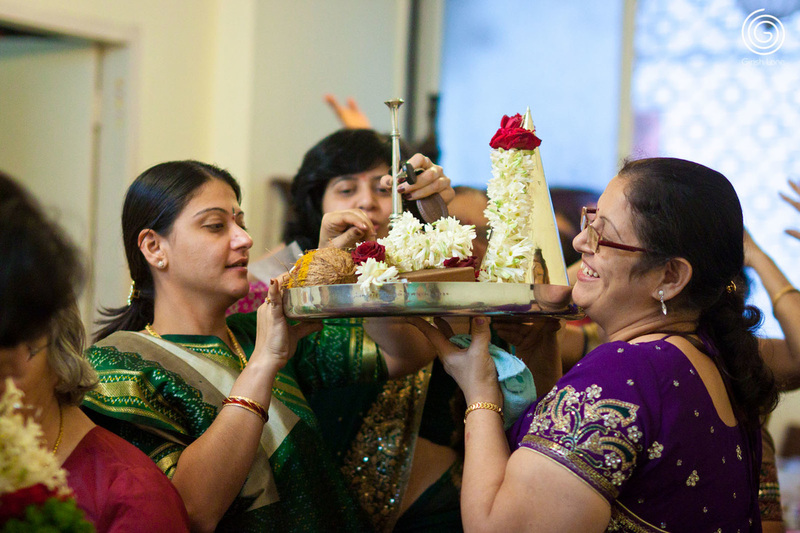 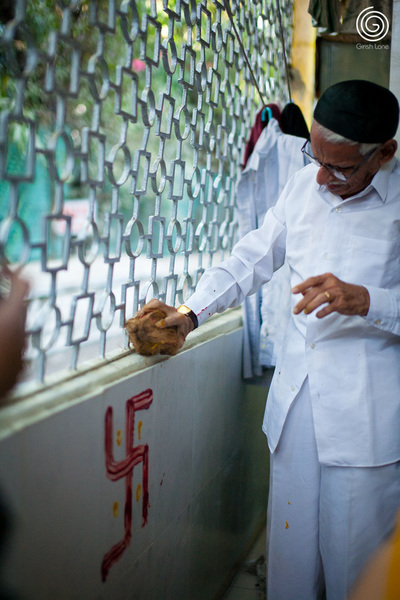 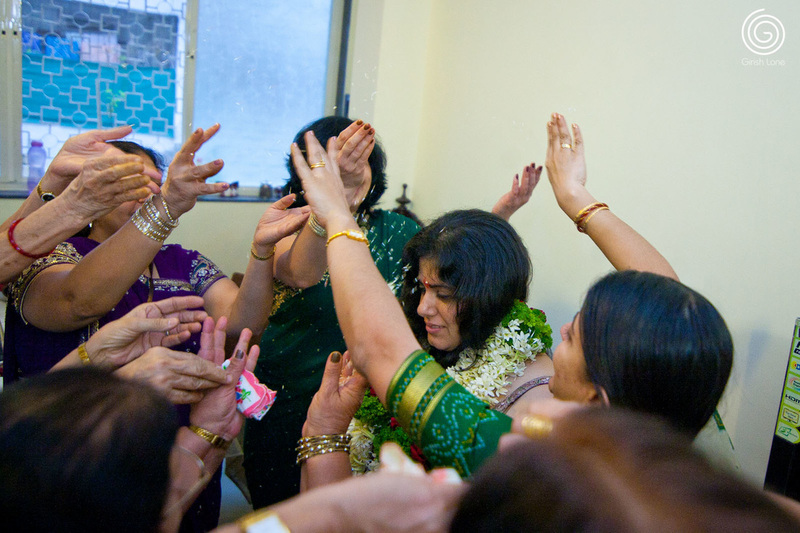 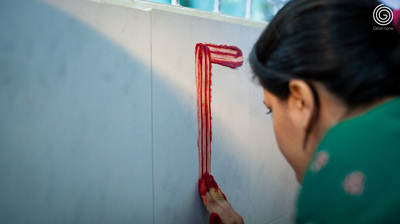 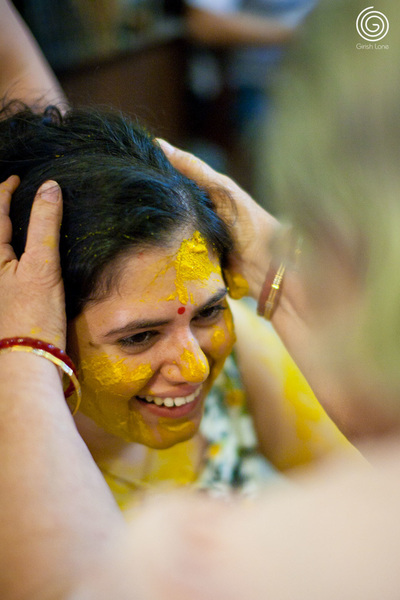 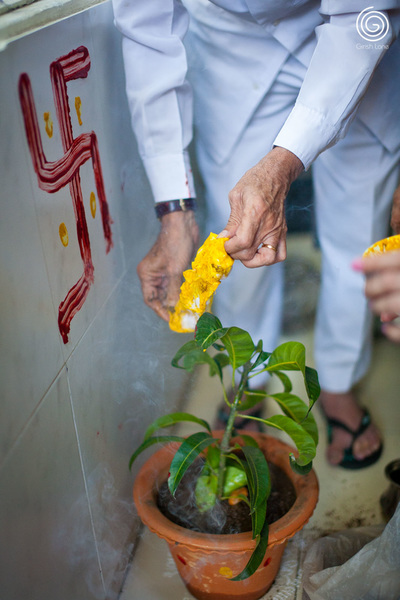 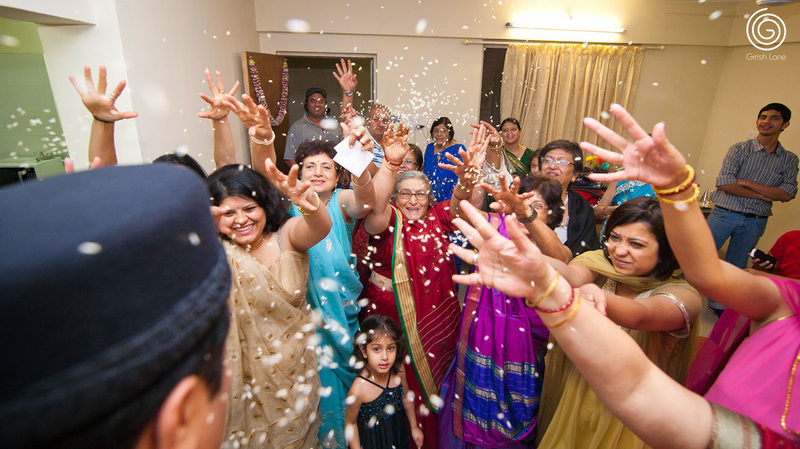 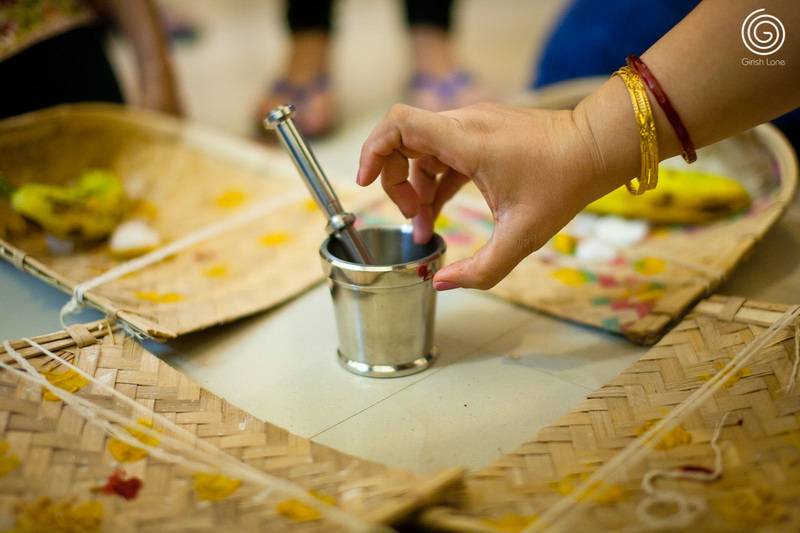 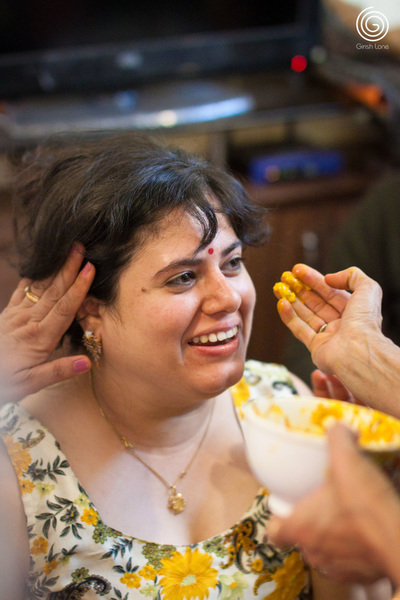 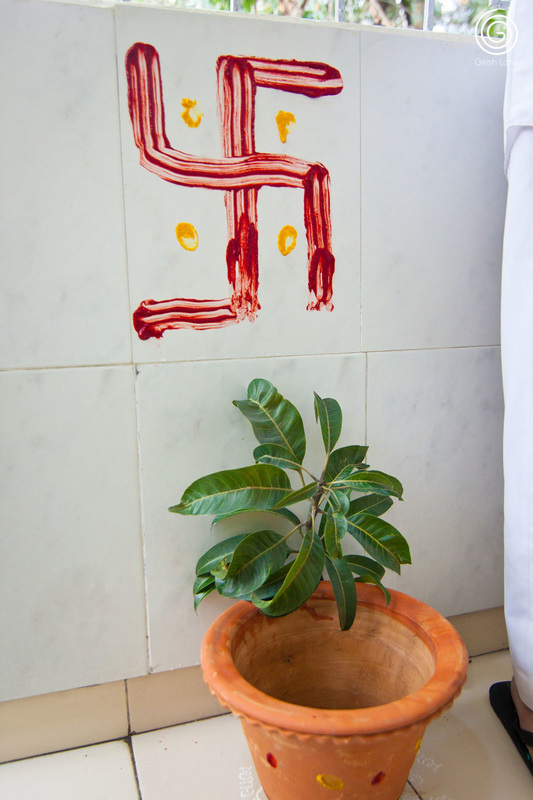 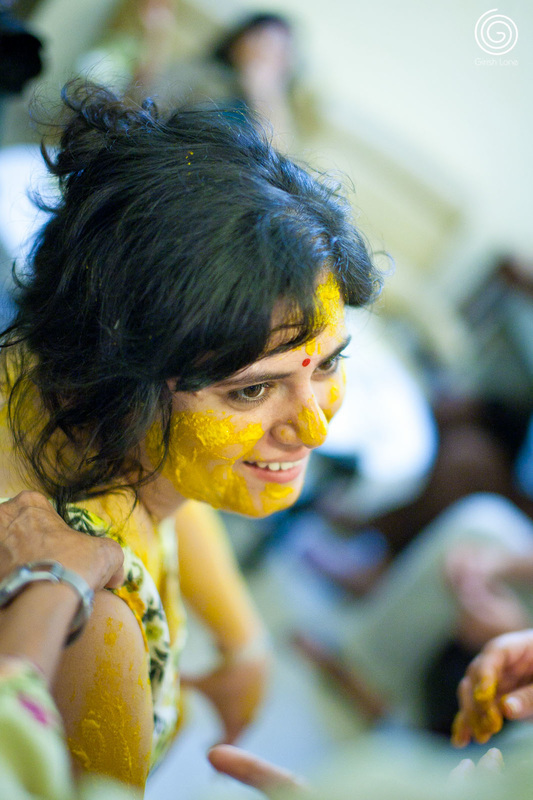 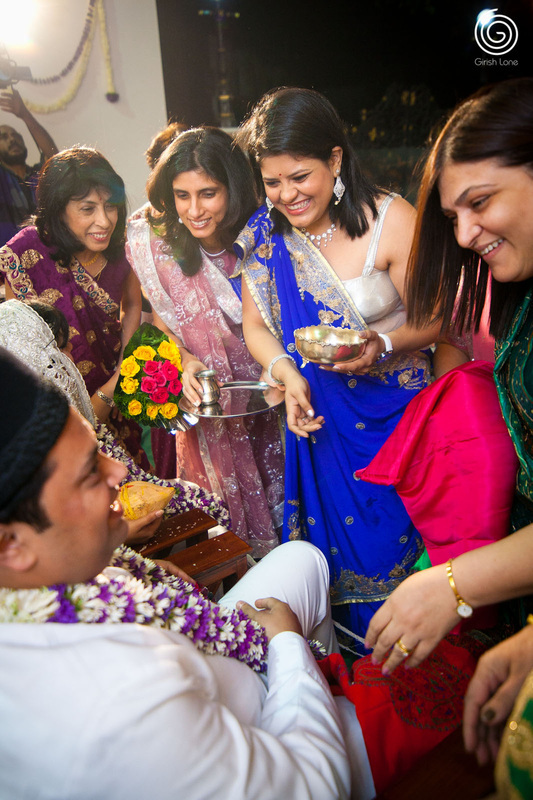 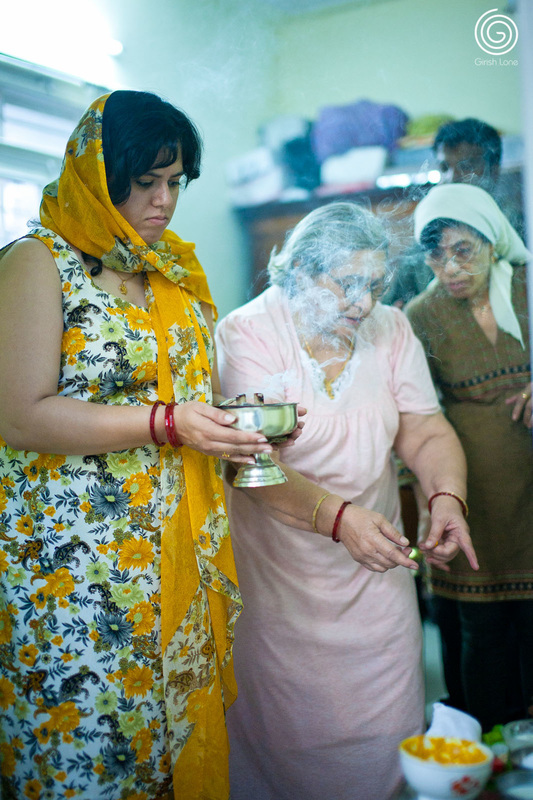 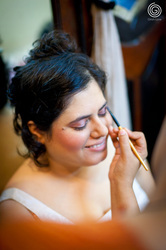 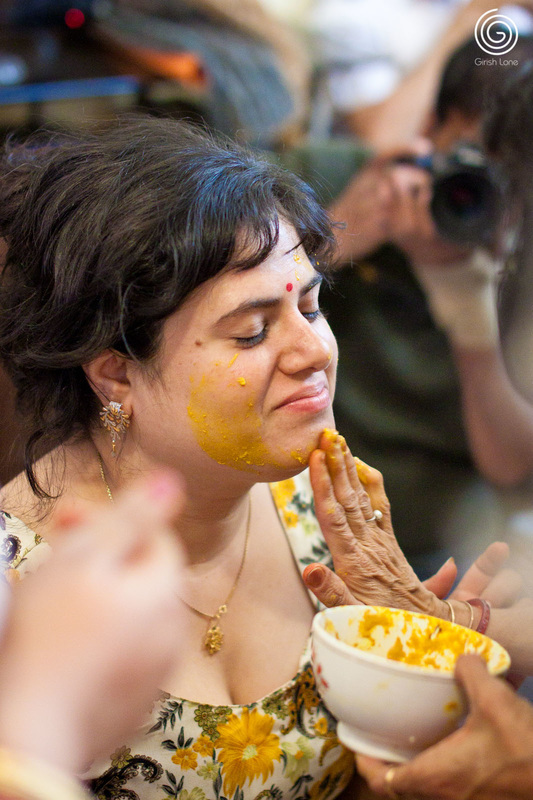 This ritual is similar to the haldi ceremony. 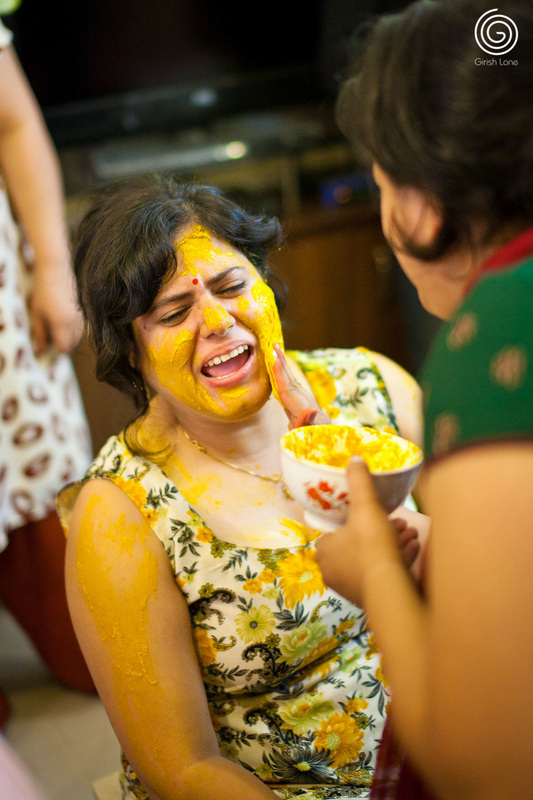 The groom and the bride were applied turmeric paste by five married women, after the perform certains rituals with supari, haldi, coconut, date and banana. 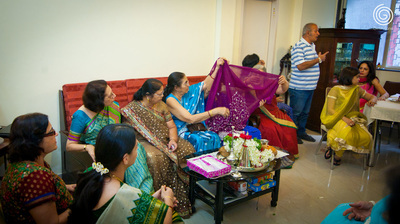 This was followed by the ritual of Adarni, wherein the Behram's family visited the Dhun's place and showered her with gifts, clothing, jewelry and lots of blessings. 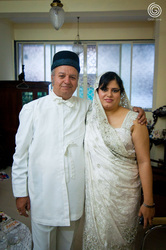 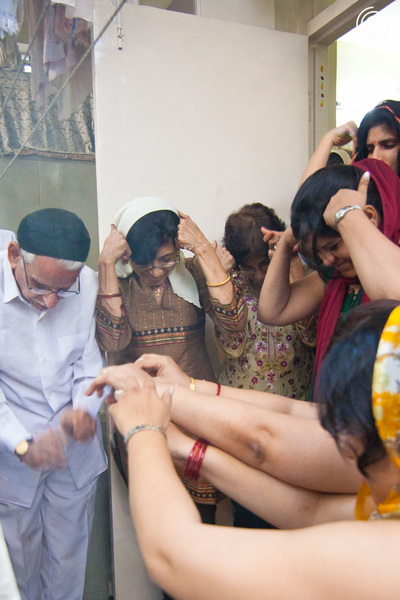 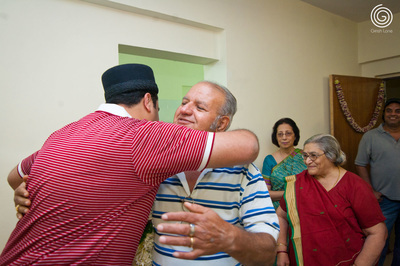 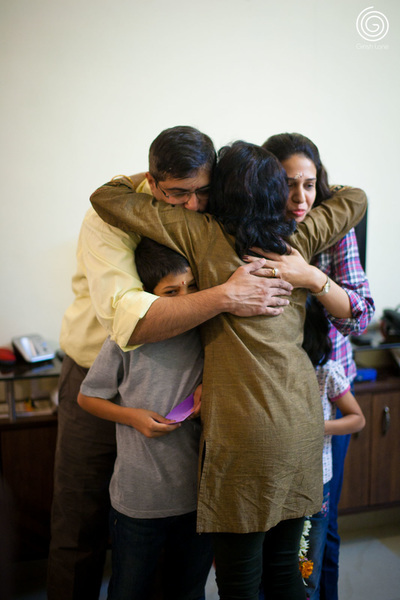 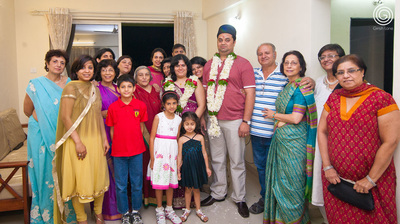 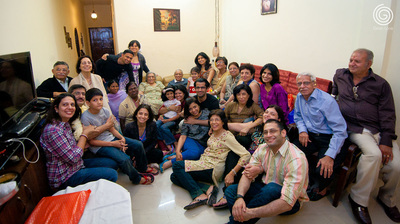 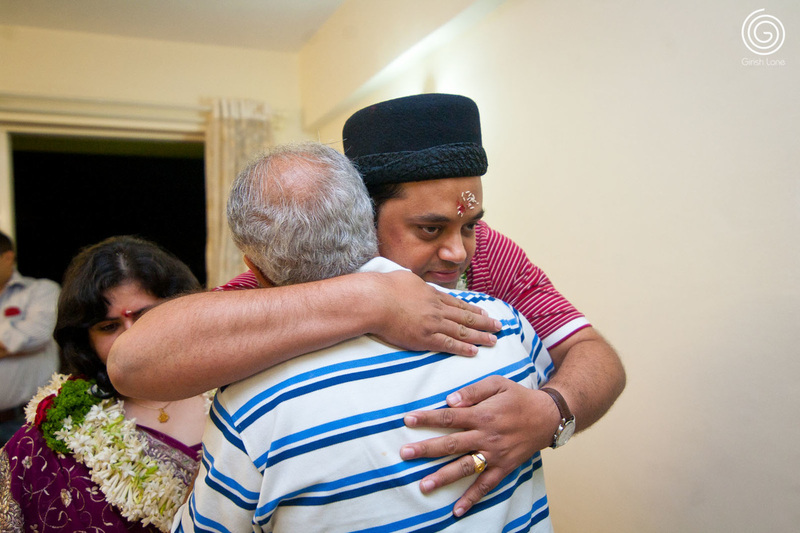 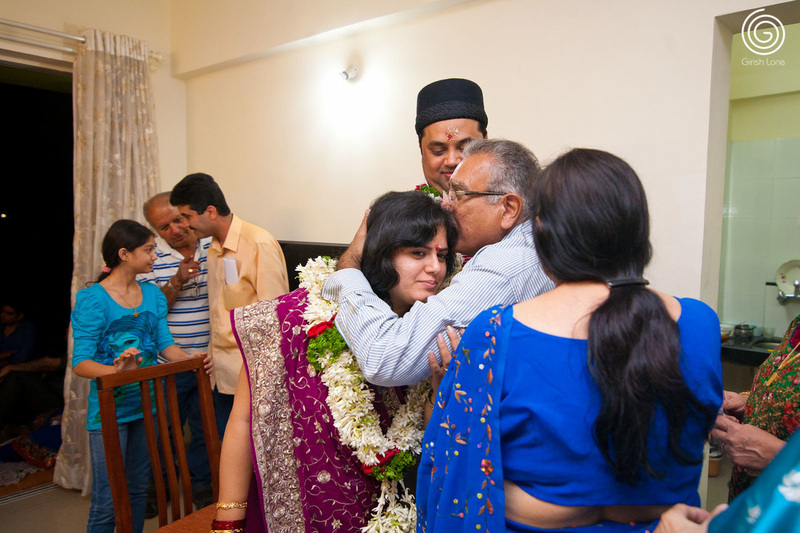 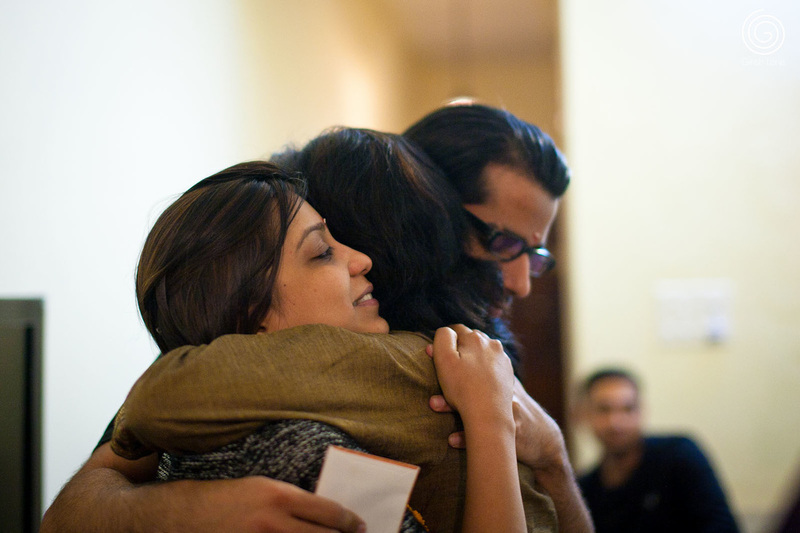 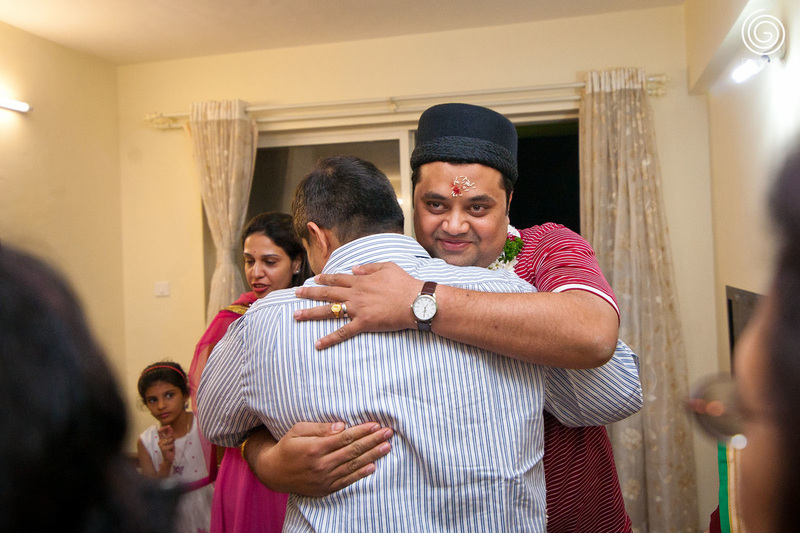 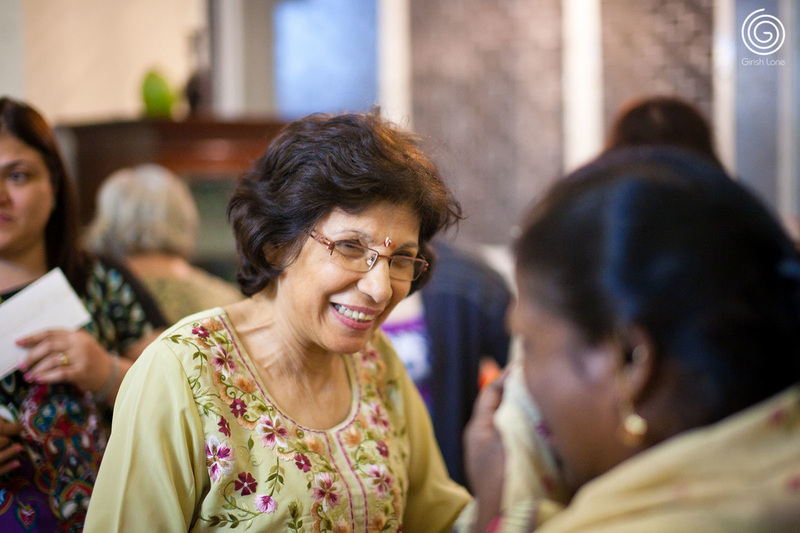 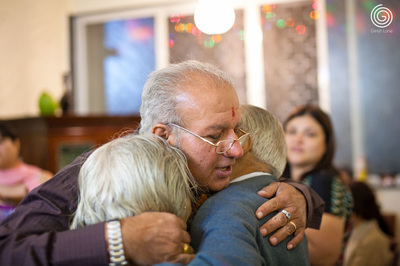 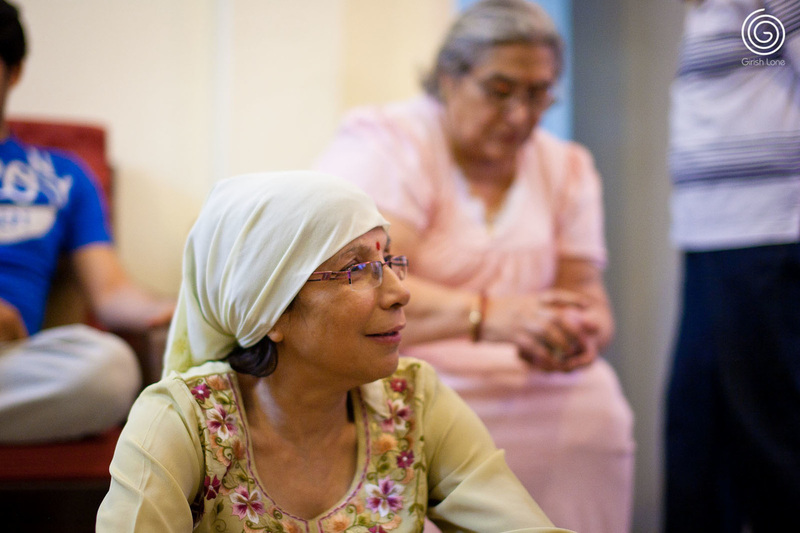 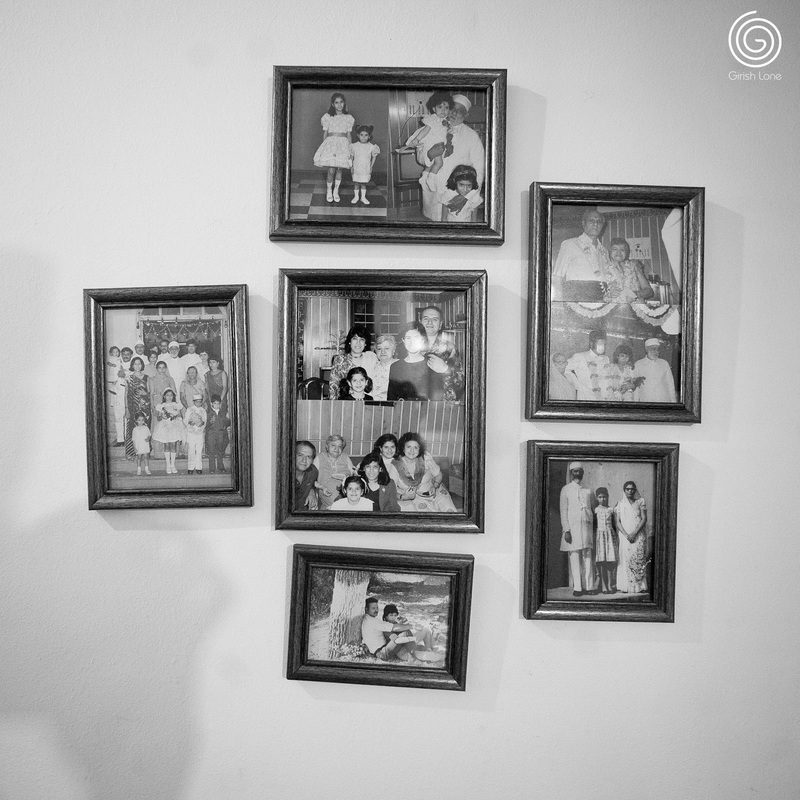 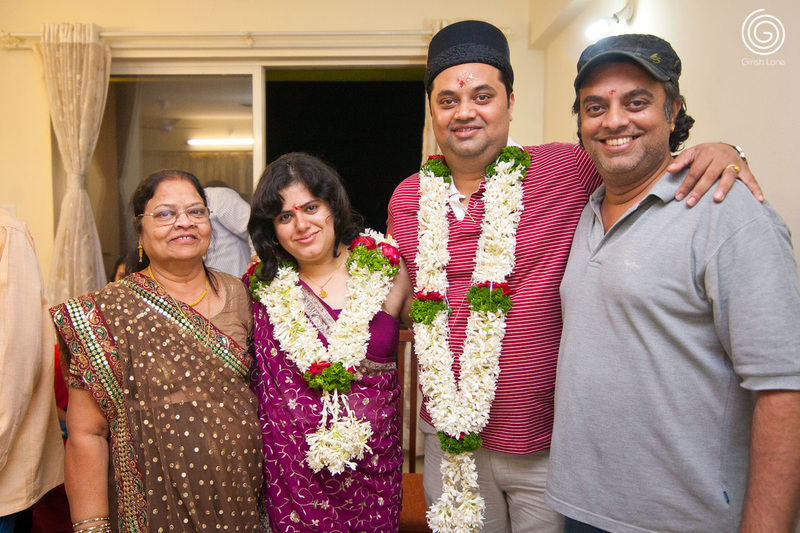 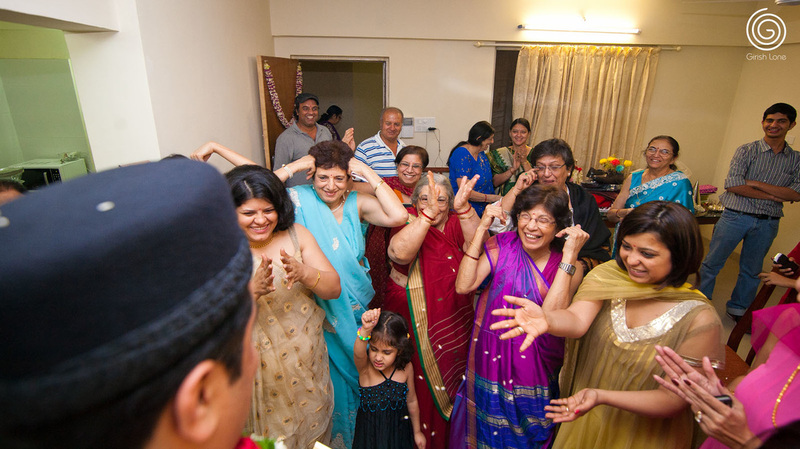 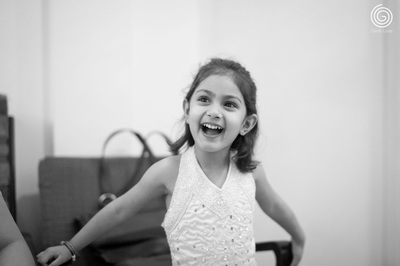 This ceremony was then repeated at the Behram's home as the Dhun and her family visits them. :-). 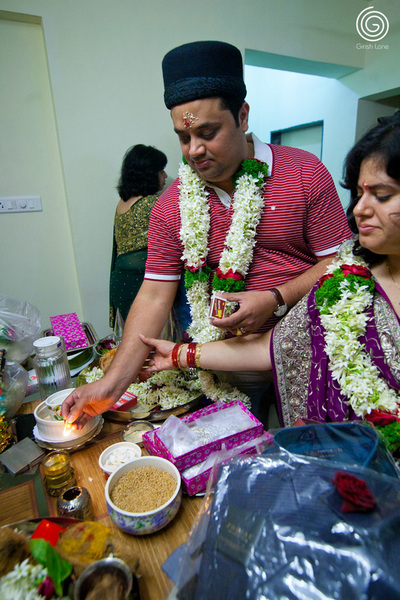 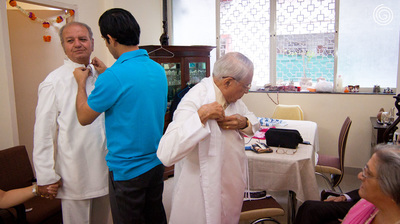 After Nahan, in which the couple takes purifying bath, each started getting ready for the wedding ceremony. 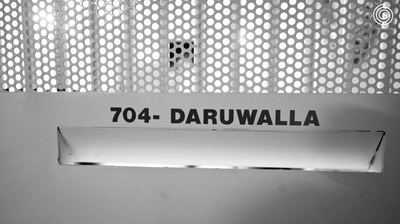 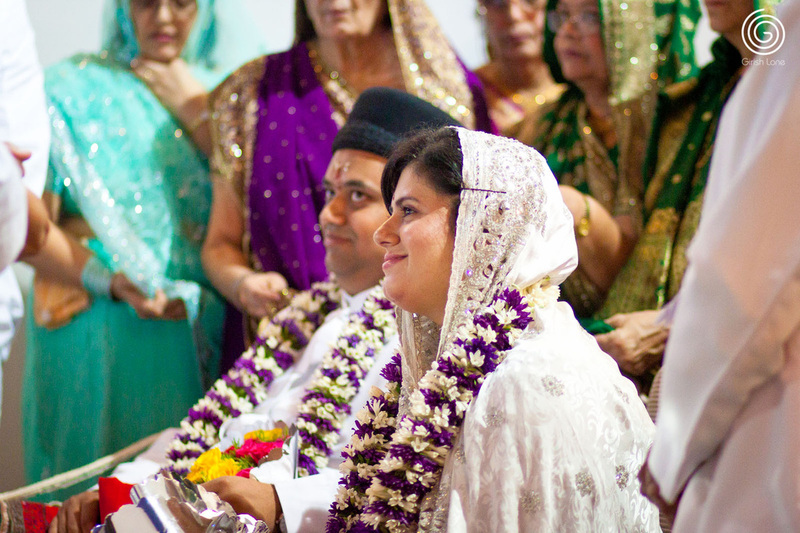 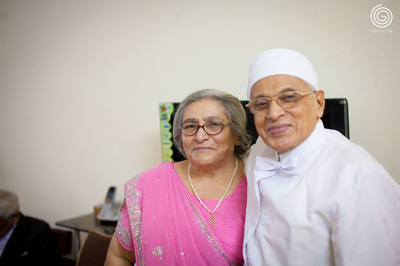 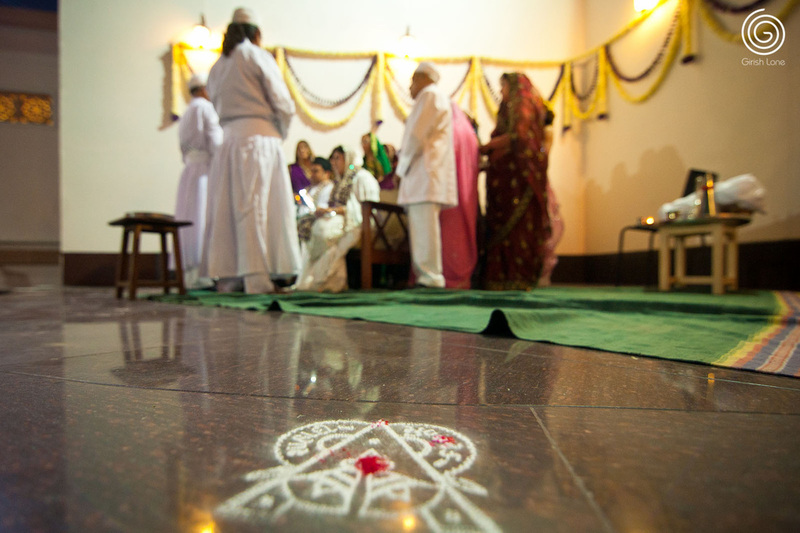 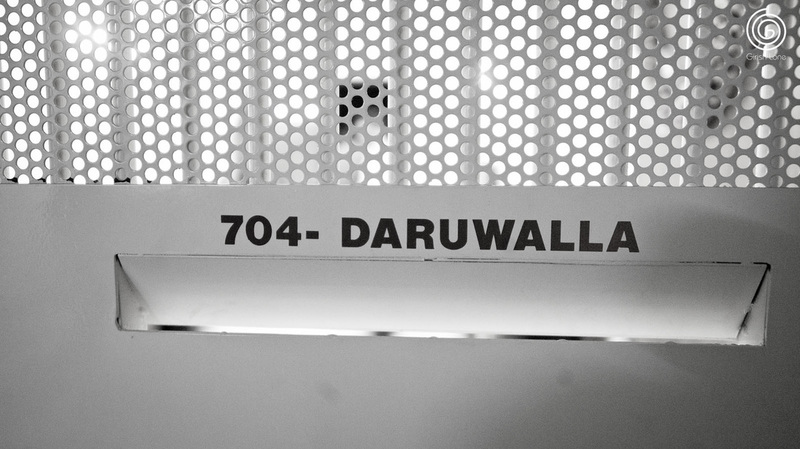 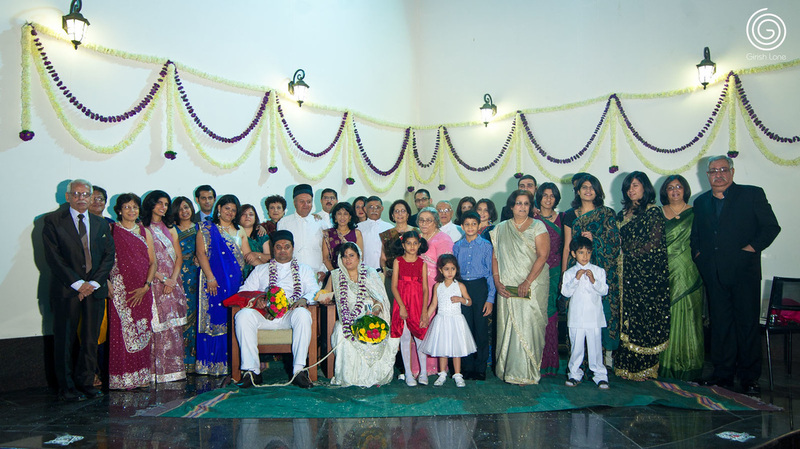 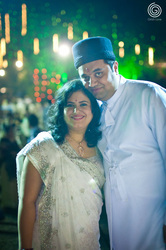 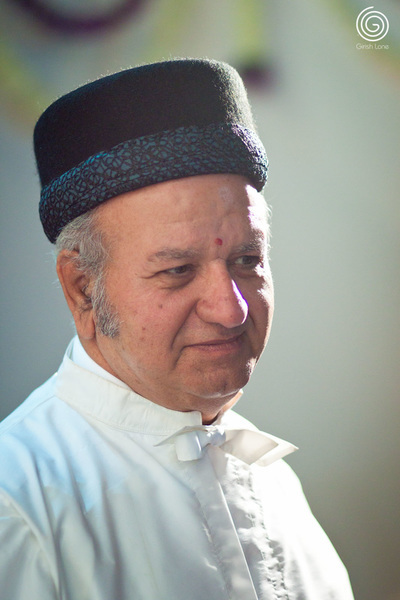 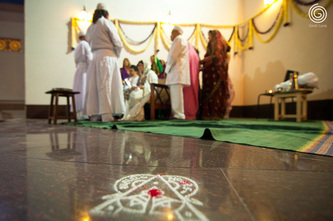 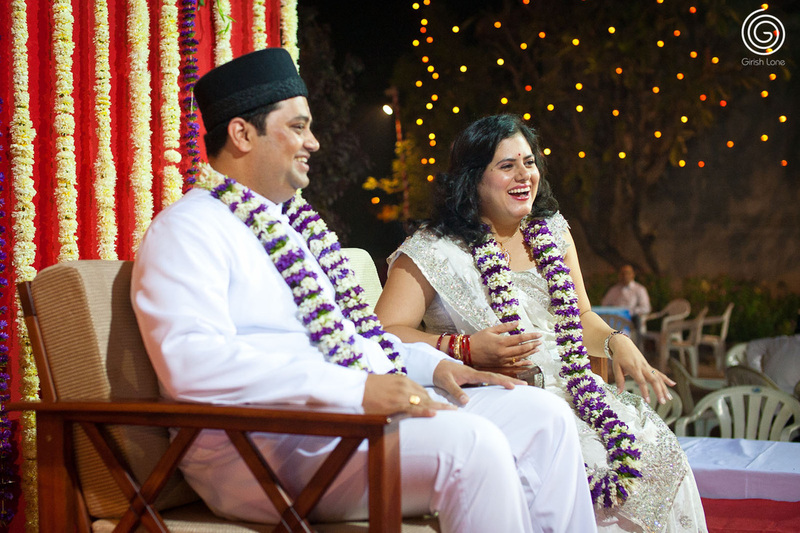 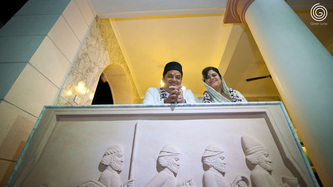 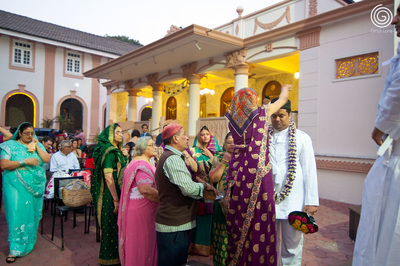 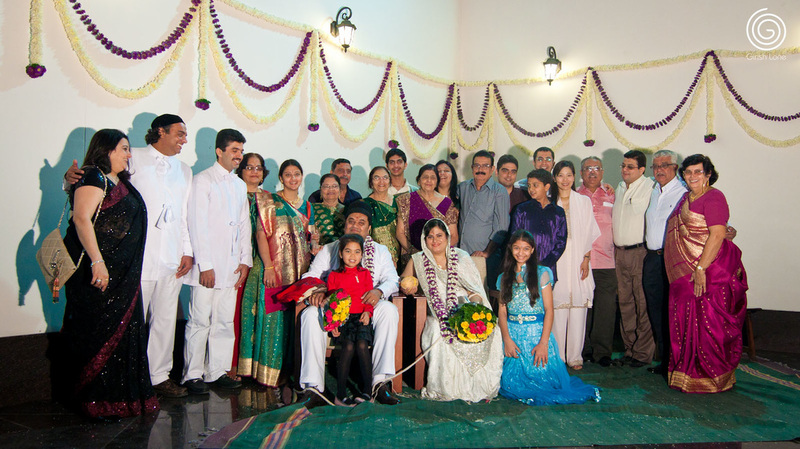 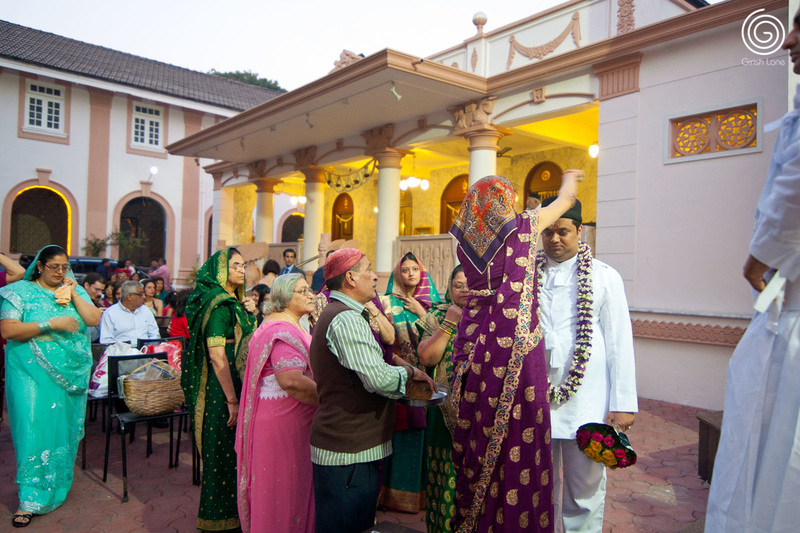 The stage was set in Sorabji Ratanji Patel Agiary, the Fire Temple, followed by reception. 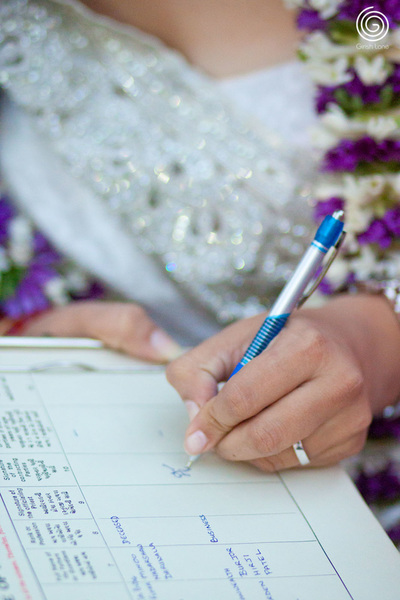 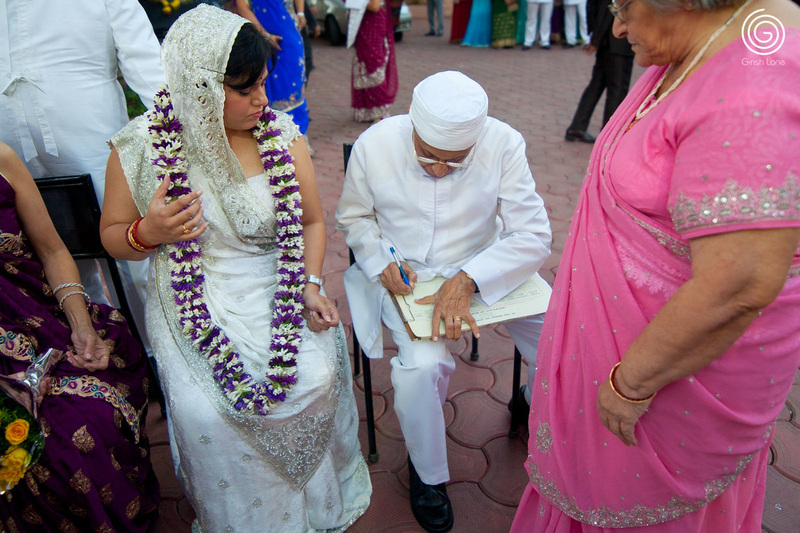 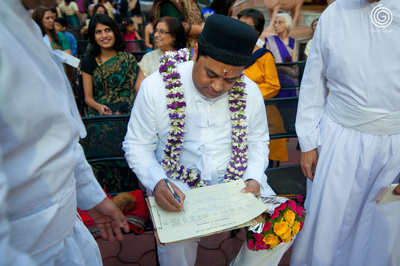 As soon as we arrived in the agiary, the Priest conducted the marriage registrations, that both families agree to this auspicious event. 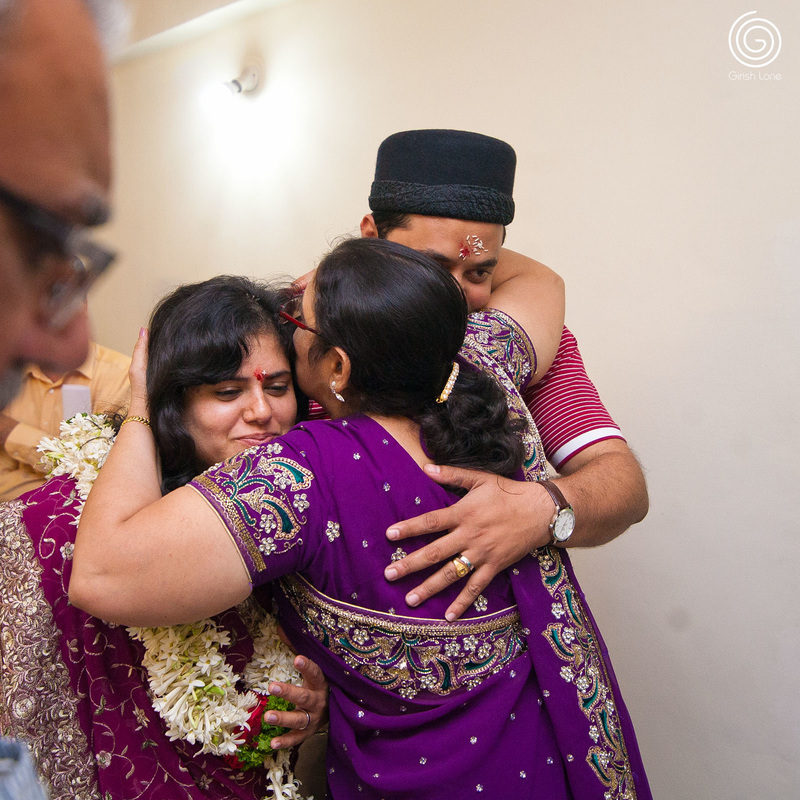 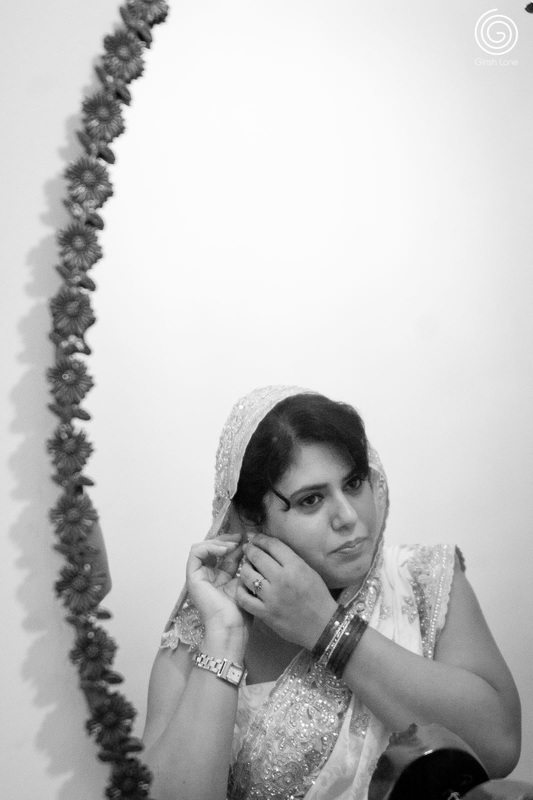 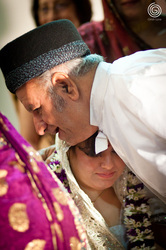 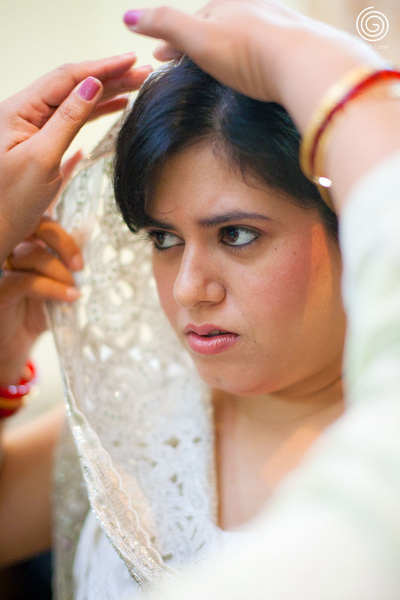 Before Behram steps on the stage, the bride's mother performed a ritual called Achumichu. 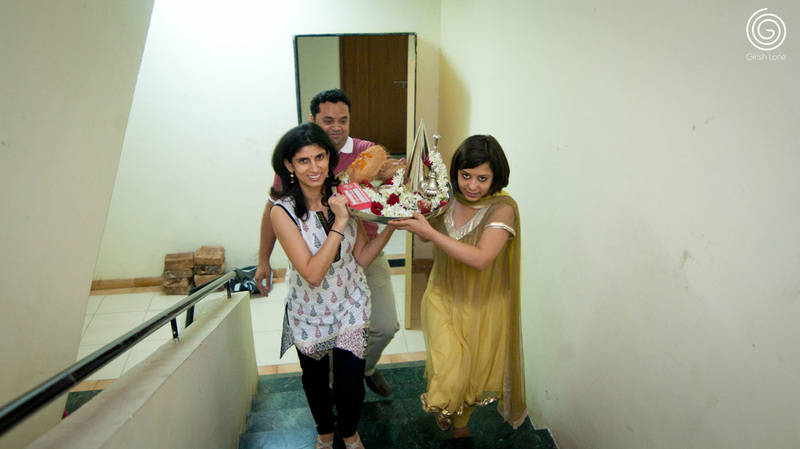 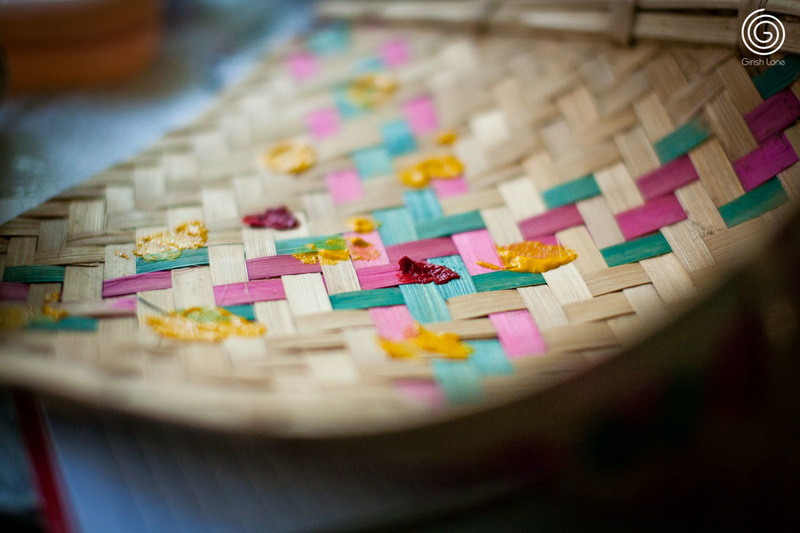 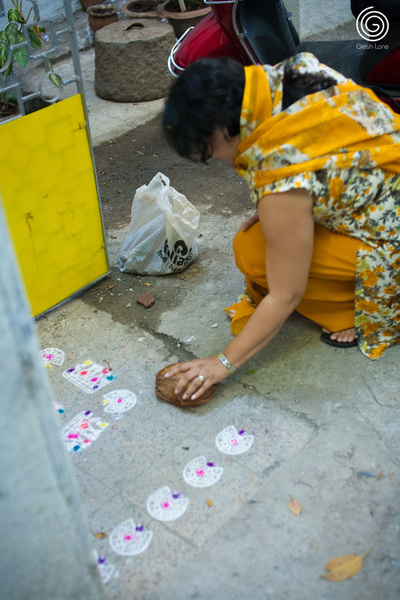 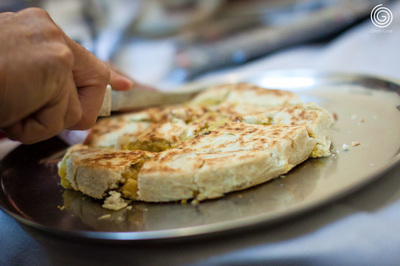 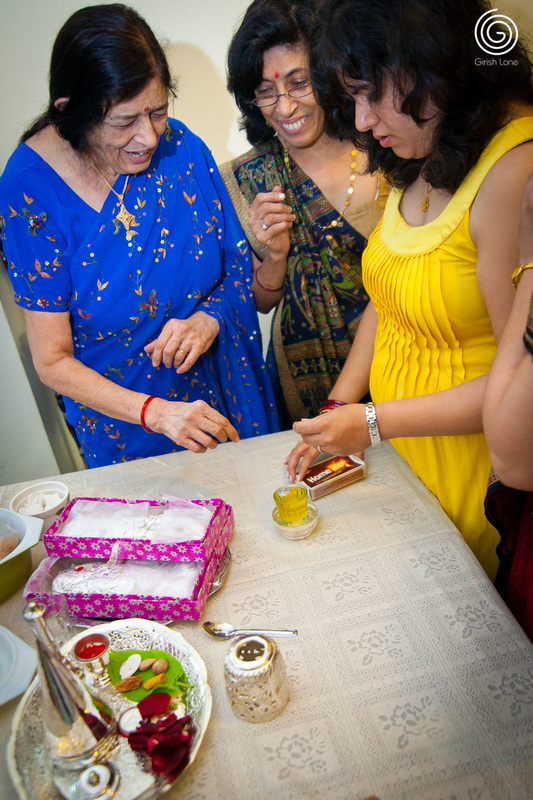 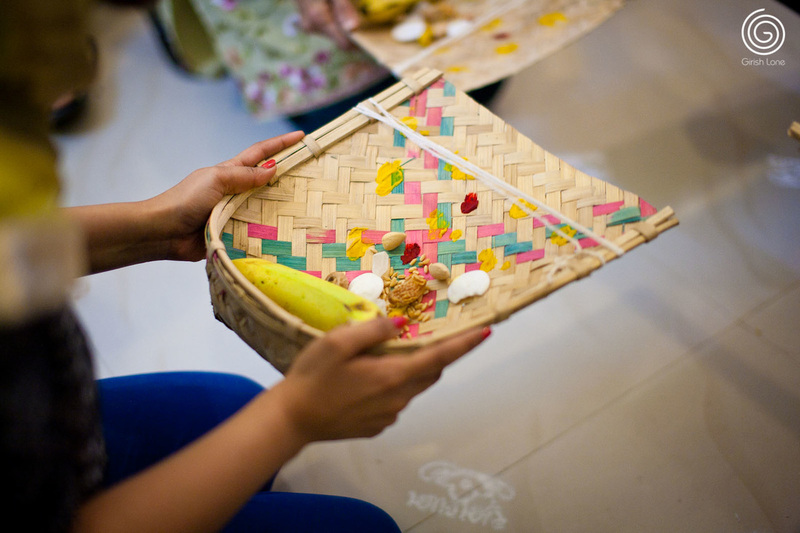 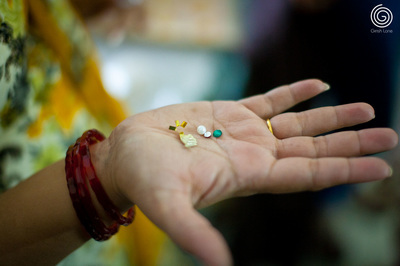 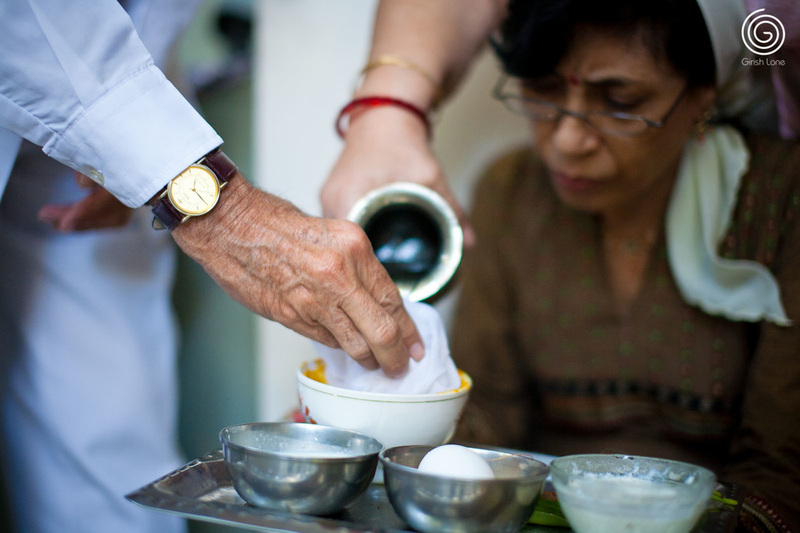 She held a tray containing a raw egg, supari, rice, coconut, dates and water. 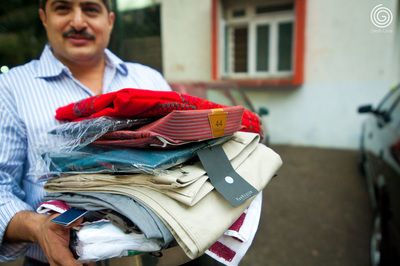 She circled all these items, except water, seven times around the behram's head and thrown on the floor. 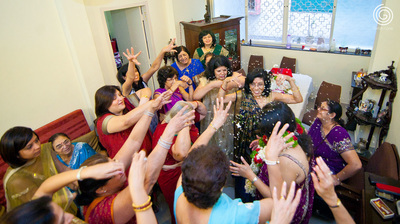 The water is thrown on either side. 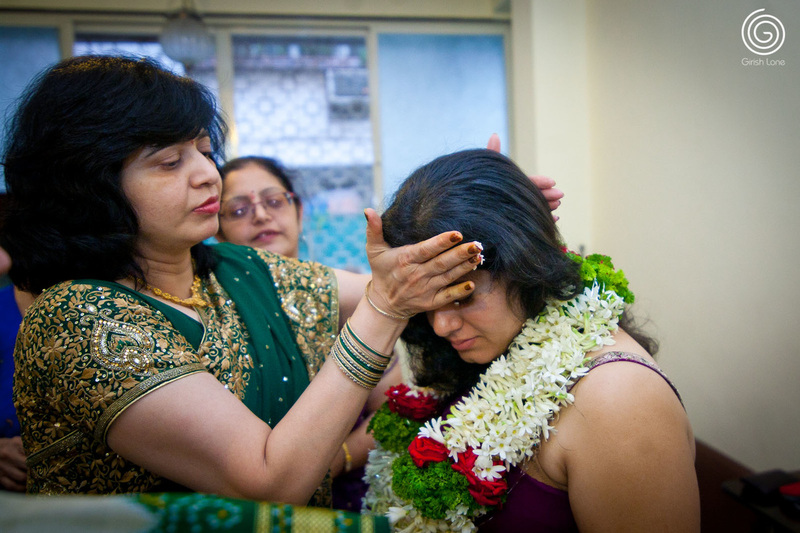 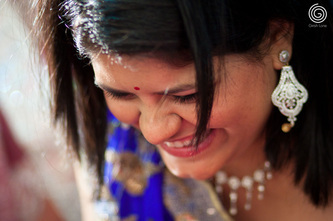 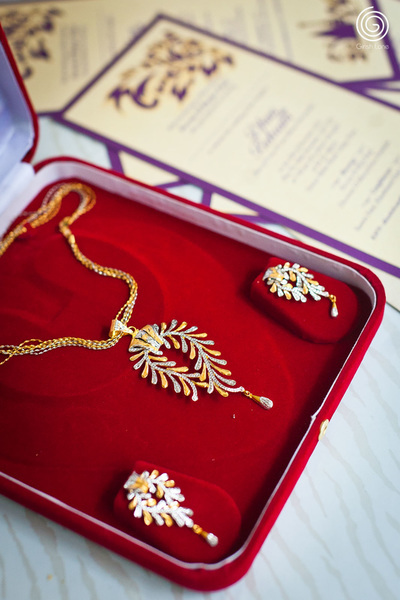 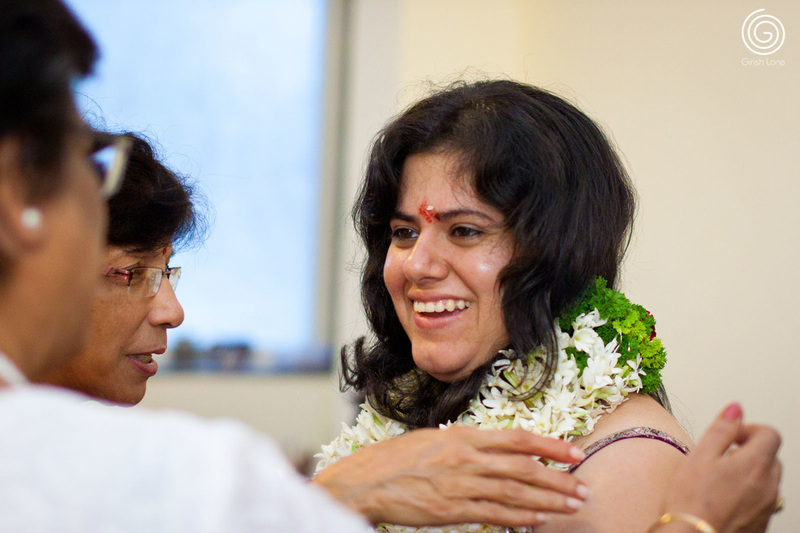 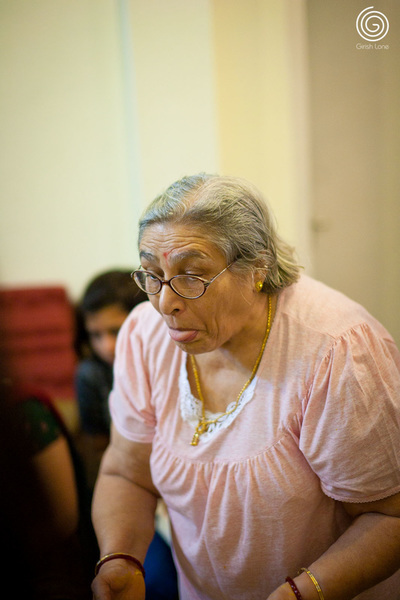 This is repeated by the groom's mother for the Dhun. 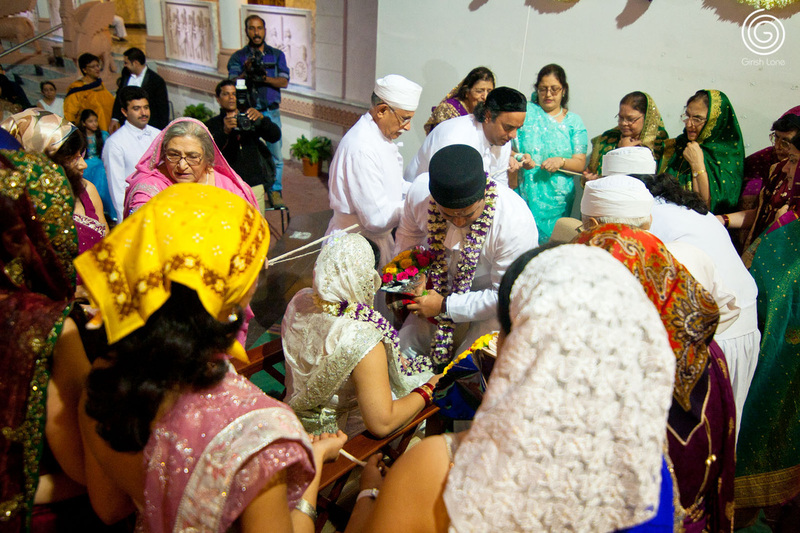 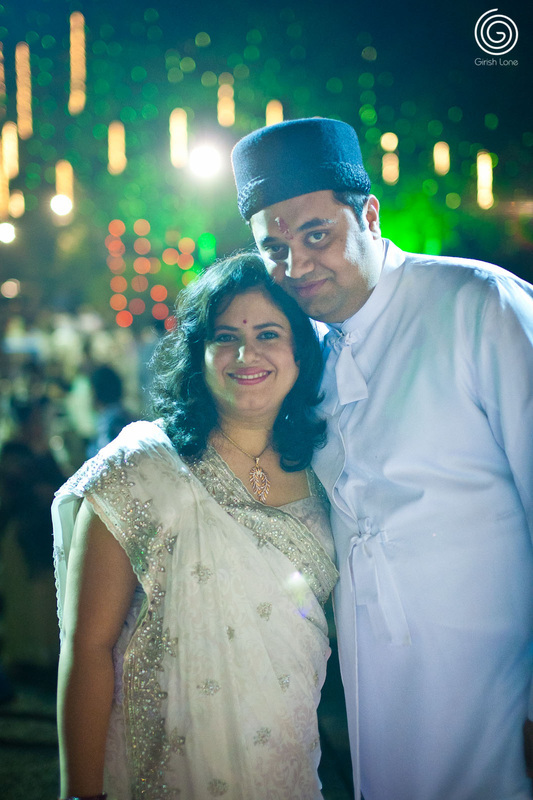 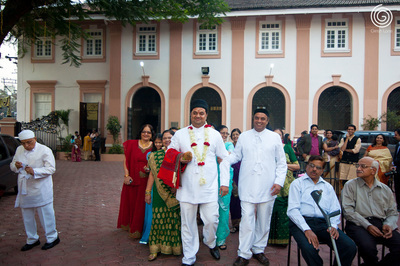 As per Parsi rituals, we were not allowed to step on the main stage (being non parsi), so we had to figure out innovative ways to catpure the ceremonies of marriages from a distance, given me a completely different perspective of a marriage as I am usually in the thick of action for all the other weddings. 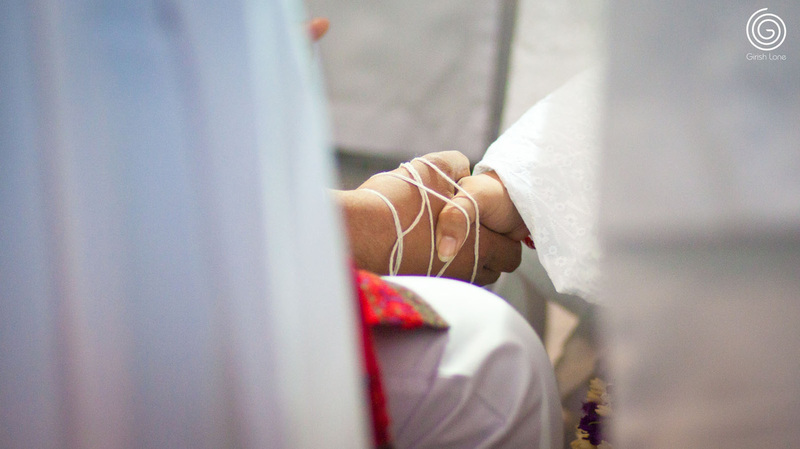 After this, the priest encirled couple with a string, seven times. On the seventh round the couple is supposed to throw rice at each other from over the curtain. 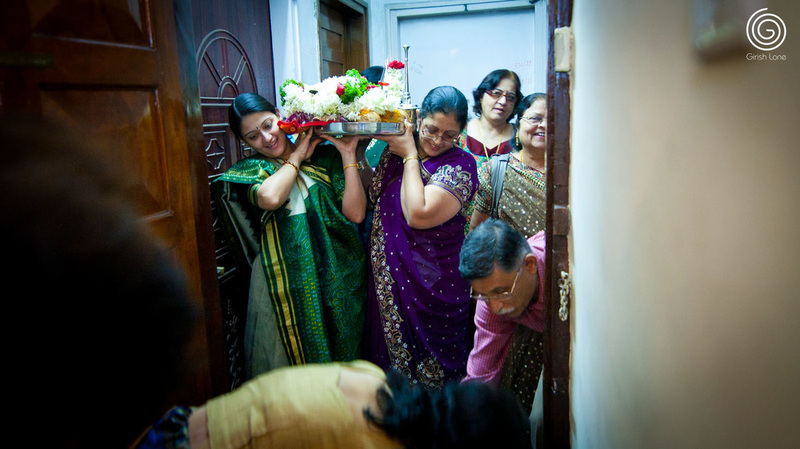 Whoever does it first, is supposed to rule the household. Then they sat besides each other with the seven strands of string binding them. 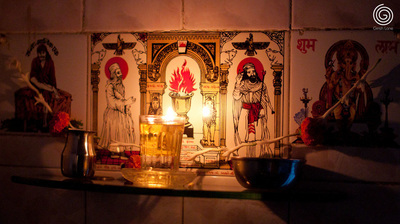 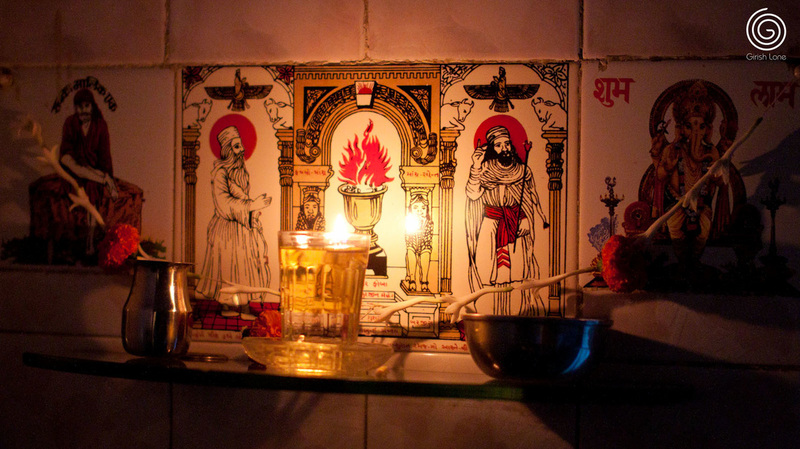 Oil lamps were lighted on each side and the priest began prayer ceremony. 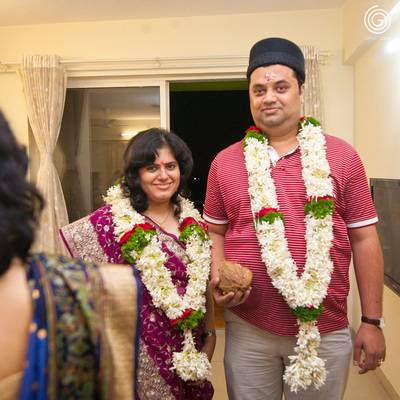 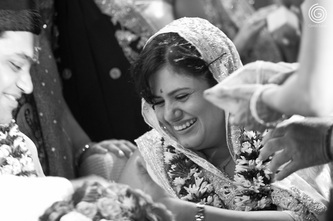 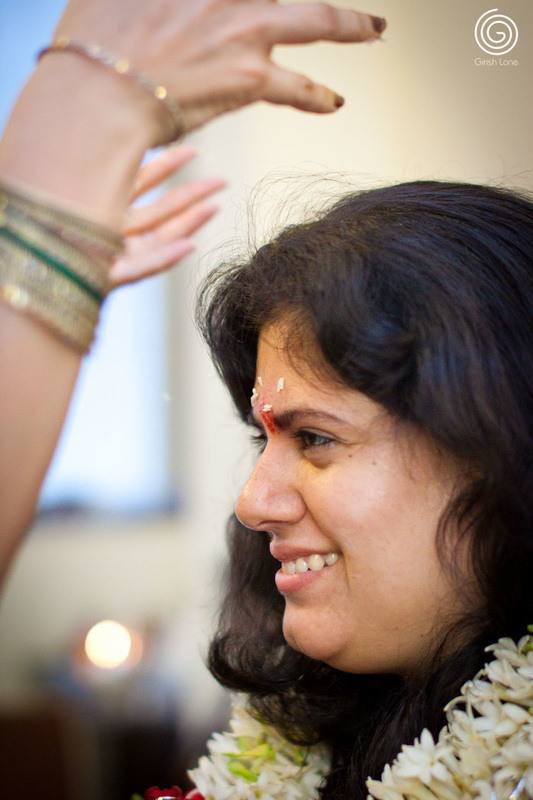 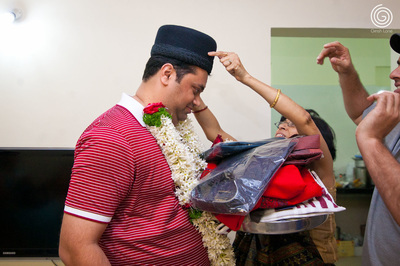 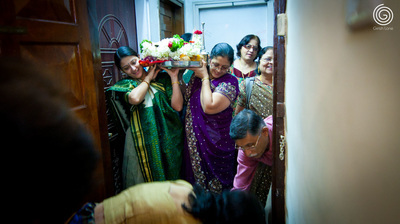 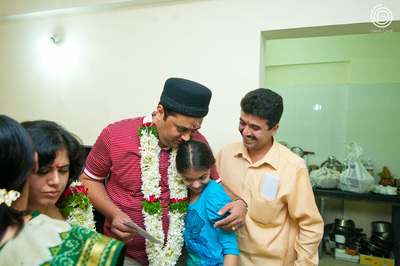 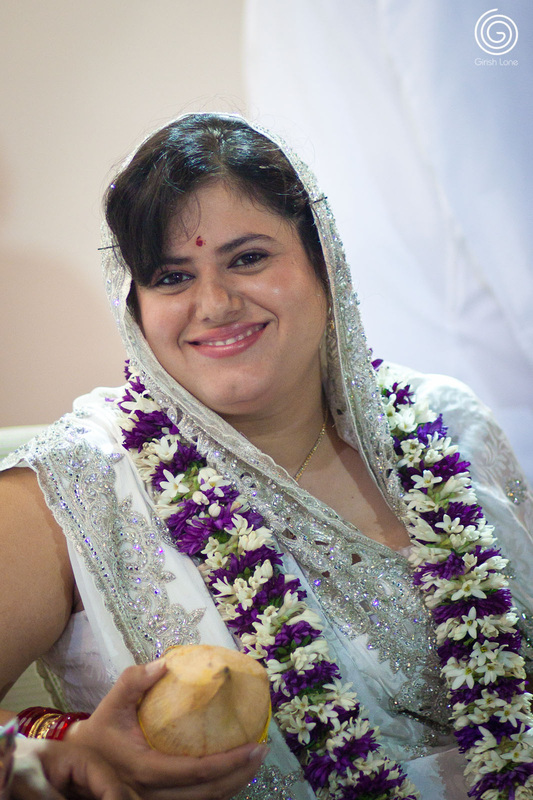 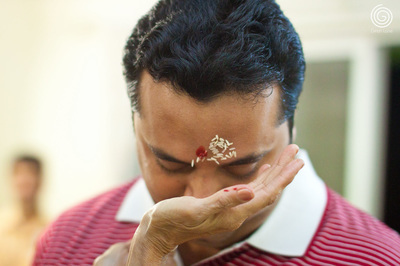 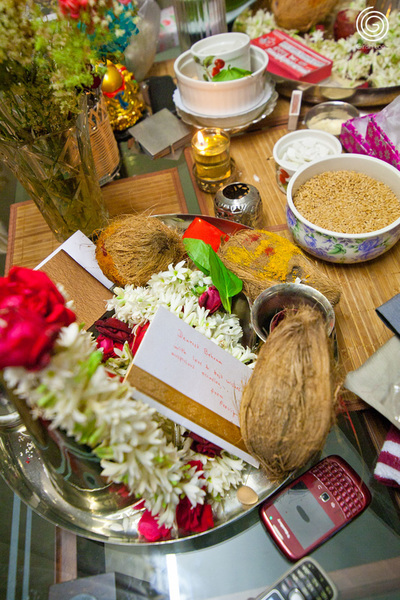 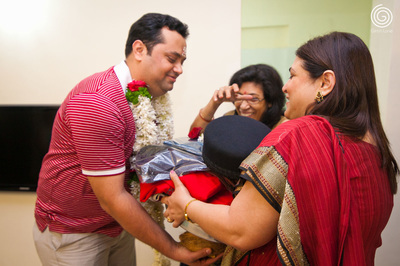 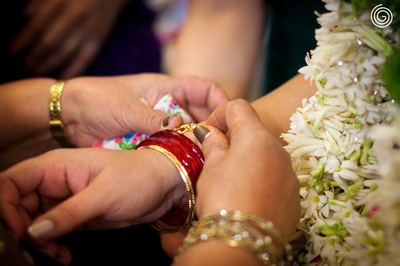 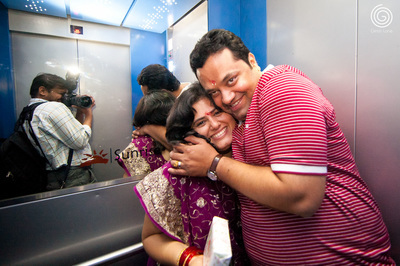 Then shower of rice and rose petals, after which the couple exchanged rings, Chero Bandhvanu.